Mankind’s response to the theme of war is ambivalent. In music this conflict is clearly expressed. The spectrum ranges from patriotic battle songs to pacifist hymns, from requiems tinged with a longing for death to the idea of the Futurists of elevating the sounds of the battlefield to the rank of a symphony. What happens when war music is played with enthusiasm, the fallen are remembered and soldiers march joyfully? The Berlin soloist ensemble zeitkratzer reflects on the historical fact that at the outbreak of war in 1914 the majority of Germany’s concert halls radically changed their programmes. It offers a high volume exploration of Bertolt Brecht and Rainer Marie Rilke’s pro-war poetry, along with fairy tales, as intoned by the Berlin Philharmonic at the start of war in 1914. Inspired by productions of the time, actor Maximilian Brauer confronts the audience with patriotic oratory. Maximilian Brauer. Born on New Year’s Eve in East Berlin in 1986. State Recognised Actor, despite failing to complete his studies. Subsequently apprenticed as a pickpocket in Spain. Permanent engagements at the Centraltheater Leipzig and at the Volksbühne on Rosa Luxemburg Platz. Not known from radio or television. Has worked with Sebastian H. and Sebastian B., Stefan M., Frank C., René P., Robert B. and others. He listens to The Germs and admires Fritz Lang. Since 2014 he has been a member of the socialist collective MXMFOREVER. zeitkratzer was founded in 1999, a European ensemble of soloists and one of a kind worldwide. The nine musicians, the light designer and sound engineer, live in European cities, coming together for working phases, frequently in Berlin. 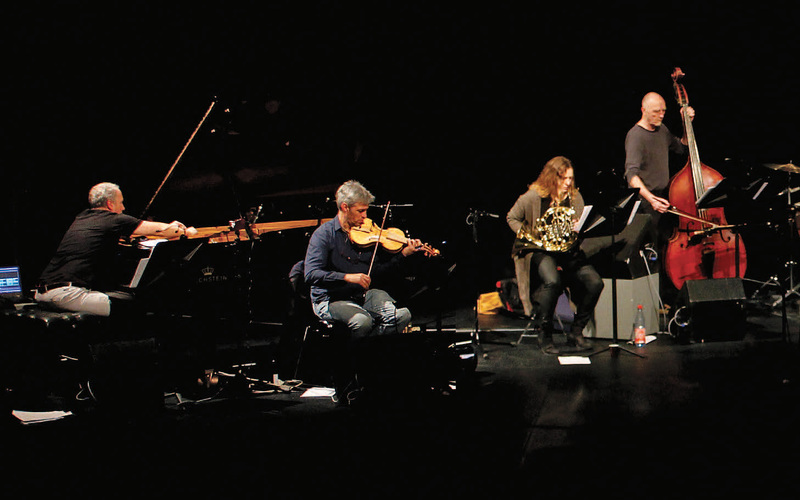 The ensemble is renowned worldwide for its idiosyncratic and ground-breaking programme. Its repertoire covers works and projects from/with musicians such as Karlheinz Stockhausen, Lou Reed, Carsten Nicolai, John Cage, Keiji Haino, Jim O’Rourke, James Tenney, Helmut Oehring, La Monte Young, Merzbow, Alvin Lucier. However, zeitkratzer is not concerned with preserving the “purity” of New Music. zeitkratzer profits from the hybrid backgrounds of its musicians: New or improvised music, experimental Rock and Pop, Noise, Ambient, folk music ... The ensemble performs regularly at renowned festivals from Madrid and London to Vienna. They now have now released over twenty recordings and almost all of the most important European radio stations have recorded and broadcast their concerts. With zeitkratzer records the ensemble also has its own CD label.